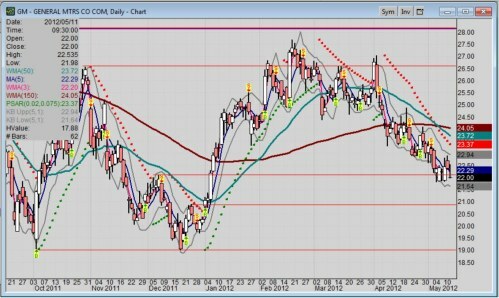 A technical analysis this weekend reveals General Motors Company (NYSE: GM) stock has confirmed even more bearishness based on a unique moving-average crossover. Some traders like to use the 50-day moving average versus the 200-day moving average to divine the market and when a stock is officially bullish or bearish. I prefer a bit quicker read using weighted moving averages, not to mention a faster long term average like the 150 day. Everyone has the right to pick and choose their favorite technical tools for market assessment. Today, let me share mine with you about General Motors Company (NYSE: GM) stock. First, the 50 day or MA 50 is agreed upon by many market technicians. A simple moving average, though, weights all the data points the same. Some revise this by using an exponential average (EMA); others use a different weighting method (WMA). My chart here uses an average that is simply weighted toward most recent data points, and is designated as WMA followed by the number of data points comprising the look back. I’m not alone in weighting data. My favorite Market Wizard (from the Market Wizards book) is Martin “Buzzy” Schwartz. Having reread his book Pit Bull a number of times, I declare that his method uses a 10 day EMA or exponential moving average. With regard to the 50-day vs. the 200-day, be apprised that Carter Worth of Oppenheimer, appearing many times on CNBC’s Fast Money, uses the MA 150. I merely add a little weighting to it. Fact is, the daily chart shows a downward fresh cross of the WMA150 by the WMA50. That tells me the medium term bearish position of the GM stock price dynamics are confirmed. Truth is, I already saw the bearishness develop weeks ago when the WMA3, a shorter but weighted average, crossed below the MA5, a simple non-weighted average which is the midline of that Keltner Band. Furthermore, the MA5 crossed below the WMA50 in March. It even tested that level but failed in early April. Now GM stock is hovering around past broken resistance, which is now support at the 22.11 level. We need to watch that level very closely. As I have written many times in my GM stock reports, GM stock is still well below its IPO price; and now the spread is widening once again. So, now the price action toward the 19.00 low is a distinct possibility. There are many factors affecting GM these days. Sure the company has come out of bankruptcy, the there is that multi-billion dollar loan that it still owes the US taxpayer. Like all debt, it’s a nuisance. I’m getting heavily criticized by readers for writing that the Cadillac ATS doesn’t go far enough by not using an aluminum body structure; and I still hold that opinion, despite the fact the car looks great; and the engineering team did well with what was assigned to them. Fact is, GM needs to make a splash where the volume is. And luxury cars, although having higher margins, are not where the heavy volume is. Still, placing a halo technology around a Cadillac that sells would bode well for GM's future. Point is, GM needs lighter-weight in large cars to make that marketing splash. EVs are too expensive for the masses; and IC engines will still be around in 2030 according to government statistics. Of course that is not the totality of GM’s problems. The stock is also suffering from a general downturn of the general market; not their fault. Like all ships in a harbor, the tide lowers them all. So, what to do now with General Motors Company (NYSE: GM)? Frankly, I’m bearish on technical reasons, but looking for a bottom pattern where I can sell some lower put options for income while I wait for that bottom to be confirmed, and perhaps still take advantage of a turnaround in price action. Didn't you just bash the ATS, a car that hasn't even come out yet and will probably shake up the compact luxury segment? Are you an auto reviewer or a stock analyst? Lord knows you aren't good at reviewing cars (particularly when you're writing reviews on cars that haven't even been released yet), so here's hoping you're better with stock analysis. Yes, I have lots of talents, Jacob. Nice of you to notice. Let's see, now, since you want to make it personal. I write one article out of about 1200 tech articles the past three years that you do not agree with, and now I am supposed to feel so put down by your open criticism that I should just give up and quit. I've made my qualifications as a design engineer, author and day trader quite public; and I know they're much higher than most auto writers who accept perks from the OEMs for their reviews. Besides, how many people do you know that saved GM $1.92M per year for a design process idea? And I had to persevere 6 years just to get it through due to all the corporate politics. I see GM far more than you will ever know. So, I do not give up easily; meaning, your criticism of my skills is merely a cheap shot that just faded away. With regard to the ATS, it was a news/opinion piece, not a driver review. Furthermore, it was based on an official GM news release that tooted its own horn on weight reduction. So, I challenged the thinking and the marketing hype. So, I did not bash the ATS as dark as you state; there was plenty of praise for what the Cadillac team achieved; but I did challenge the direction that GM is taking Cadillac by under-using known technology that it, the corp, needs badly to compete. That was the angle, that was the focus; but your thin-skin feelings appear too offended to realize it. The ATS as designed reads to be a fine car.I was an owner of the 2005 Cadillac CTS; so I know the brand personally. However, it was a corporate opportunity missed to set Cadillac as the best of GM and the best in the world. A new car, a new model, with lots of money spent. Fact is, their own new release boasted of low weight when it was a nothing earth shattering, and BMW achieves it without so-called exotic materials. Based on what I just read at Marketplace.com, I can't help but wonder now if the Buffet purchase of GM stock in Q1 is the main reason for that bull move in Jan. and Feb; which may prove once again that the perception of the fundamentals are being reflected in the stock price.